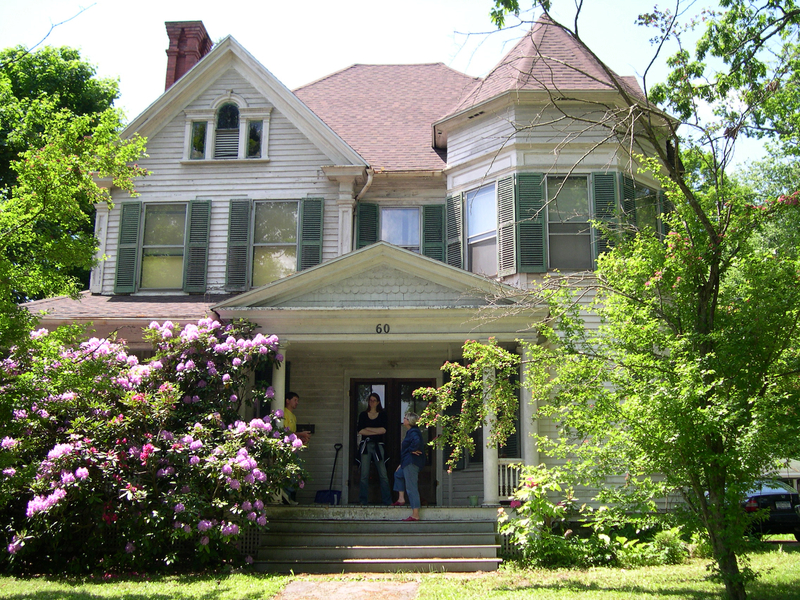 When Bill and I were first looking for a house together, there were a few things that I really wanted. I didn’t care how many bedrooms or baths, and I didn’t care about the year it was built or the style. Granted, house-hunting is quite different here in New York than anywhere I’ve been. There aren’t “suburbs” and new construction means “double-wide” or anything after 1960. So, I adapted with a few requirements that stuck. Secondly, I really wanted a fireplace. It is so cold here, and the snow makes that bearable. But, the fireplace is my winter therapy. The light even makes a room seem warmer than it is. We’ve adapted the coal fireplace here to a usable status; so we’ll show you that in a later post. 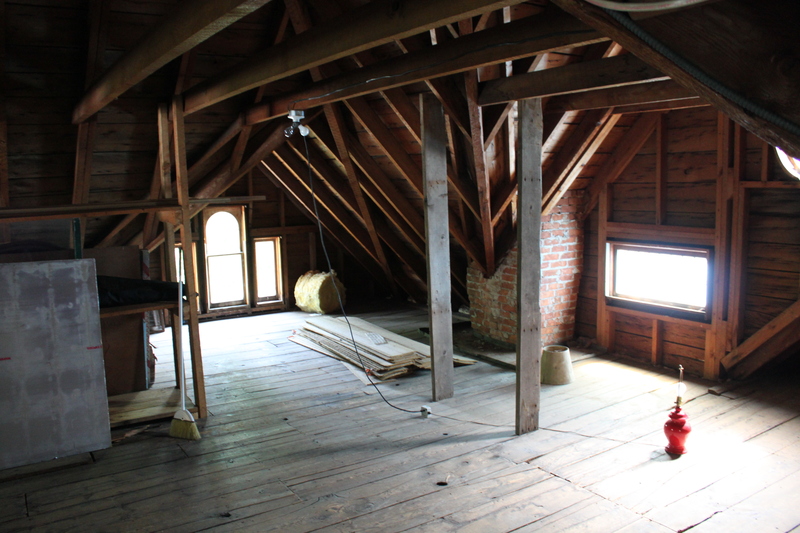 Lastly, I wanted a walk in attic. Now, I didn’t realize that could be something that one could want, until we visited a glorious Federal home a few towns away. This amazing brick house was a consideration of ours, but the trailer park neighborhood across the street drove away our interest. 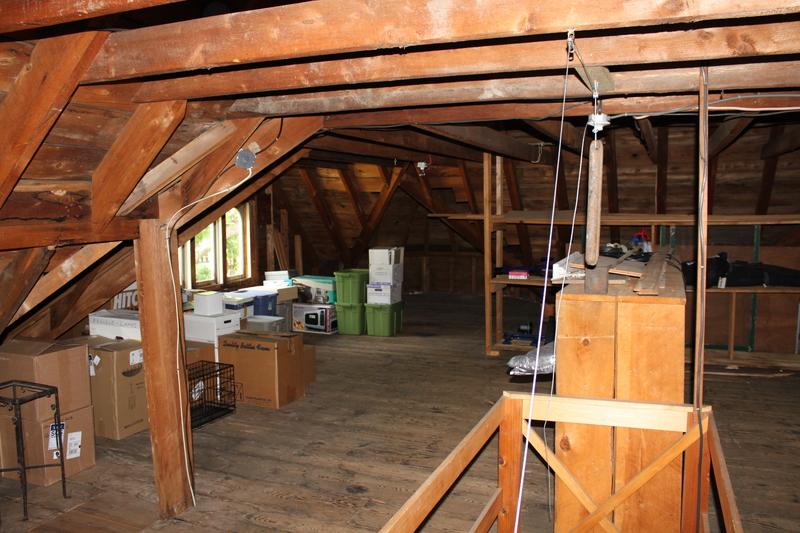 However, it had a full walk up attic, where “I” could stand! And it had windows, and old trunks! Quickly, needing an attic became a requirement. 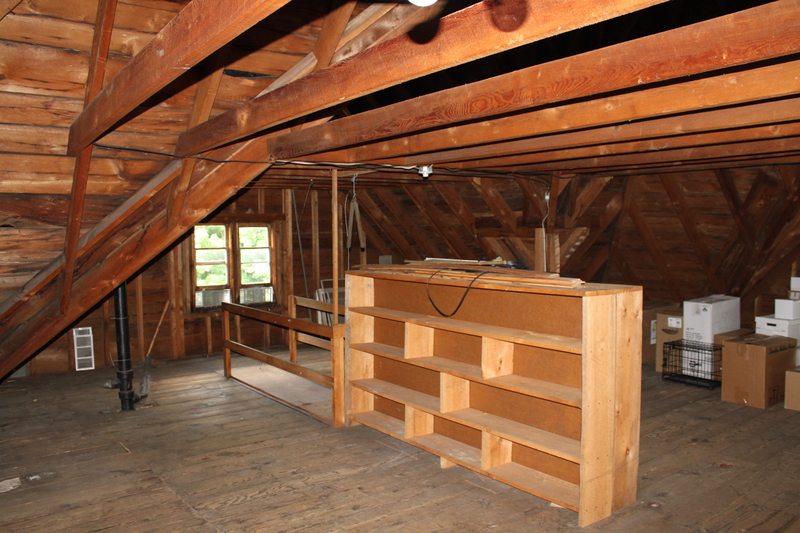 For most of the houses we visited, Bill looked at the attic and the basements first, to give me a full report. 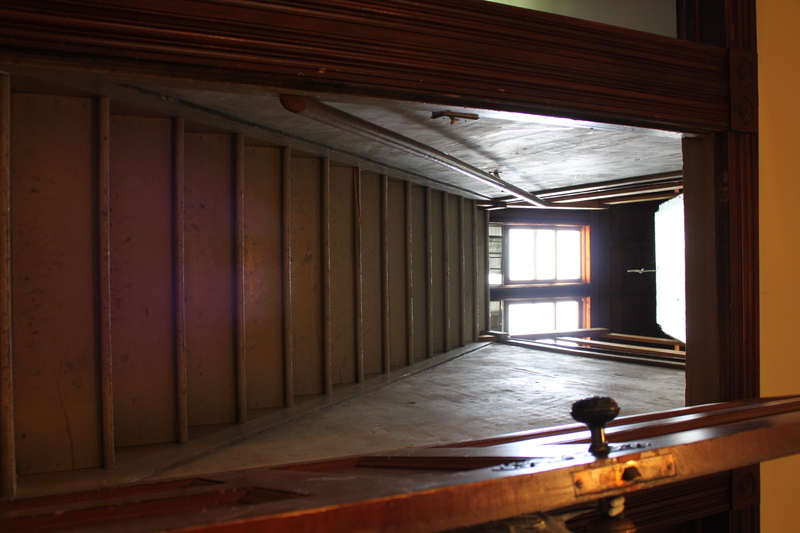 At 60 West Main, it looked promising when I saw the STAIRS that led up to the attic for this house. Bill shook his head and said, “Well, its a deal breaker, you’re not going to like this.” I couldn’t have imagined what it would look like. The trap door opened to reveal a full walk up attic, with windows on all four sides and the original beams showing their hardy structure. I was in love, and ready to move my studio in right away. Apparently, though, I’m not allowed to put a wood stove up there, and its not safe to heat without changing the whole thing. We would have to put up sheet rock to cover the beams, and insulation and ultimately hide its glory in order to “use” it for living space. So, instead, I visit it when I can, and I’ve put a light up there so that it shines through the three stained glass windows up there on winter nights. This year, I might even put a small Christmas tree in one of the front windows. I want to live in your attic. So cool! I never thought I wanted a basement until I moved to Florida. They are unheard of here, so I understand your desire for an attic. I am really enjoying the tour of your house. No “visitors” that we know of. The house is very peaceful and quiet. It doesn’t even creak much when we’re walking around. Thanks all for reading! What a great space! If I only had a room like that where I could write. The beams are perfect. It would have been a crime to hide them. Hi Dear Aaron! thanks for dropping by the blog, it is a great thinking space up there. Wow! I do love the attic! You guys are awesome to do this blog… I love seeing the transformation! Travel safe and stop by anytime! What a nice attic! It looks so cozy up there. I can picture what it looked like at the turn of the century (19th to 20th) with the trunks placed near one another, ready to pack for a train trip. I wish I could store all of my stuff in trunks up there, instead of cardboard. 🙂 It would be amazing to see this house new, as it would have been in 1894.